A supportive company culture isn’t a "nice to have" — it’s a must. 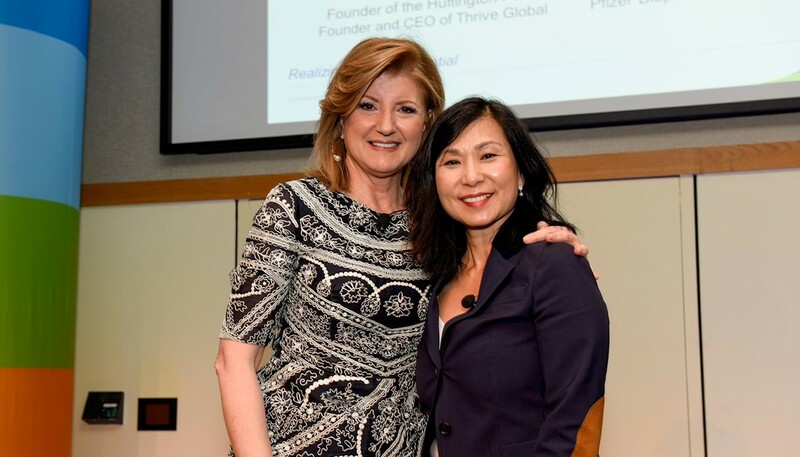 Last week, as Women’s History Month came to an end, my colleagues and I were joined by none other than Arianna Huffington, founder of The Huffington Post and founder and CEO of Thrive Global, for an inspiring event hosted by Pfizer’s Global Women’s Council. When I think about where we are at Pfizer right now, entering a new era of growth, I am more focused than ever on what I see as essential to our success: our culture. At Pfizer we talk about the importance of unleashing the power of our people. We know that by creating an environment where colleagues feel personally and professionally fulfilled, we will be more successful than ever in delivering breakthrough medicines to patients. And Arianna reminded us that it’s not enough to just talk about culture, we must demonstrate it in everything we do. Because actions speak louder than words, and as a leader, I know I have a responsibility to show the way. Listening to Arianna, it struck me that as a leader I need to look after myself if I’m going to be at my best for everyone who relies on me, at work and at home. I think I do a good job of managing my energy by staying away from the things that drain me, but equally I need to prioritize restoring my energy. So, I have already started using some of Arianna’s ‘microsteps’ to help me create a better sleep ritual. Another example of energy restoration is to make sure I am focused and in the moment. Last week I attended a school event with my daughter and I was fully present. I arrived on time, didn’t check my emails and paid attention to the event and my daughter. Getting back to work afterwards, I was conscious of a difference in my mood and mindset: I felt restored, fulfilled, and able to power through the rest of my work day with renewed energy. A win–win! Samuel Beckett famously said, “Try again. Fail again. Fail better,” a philosophy that should apply to all of us. But some people seem to be better at putting failure in its place and embracing new opportunities, no matter the outcome. For myself, like Arianna, I’ve chosen never to hold back and have made big bets on myself throughout my career and life. A lot of this traces back to my upbringing, because my parents encouraged me to go for every opportunity that came my way. Living as we were in South Africa during Apartheid, we knew that no opportunity could be taken for granted. To my mind, failure isn’t something we should overthink. While we can strive for excellence, aiming for perfection only gets in the way of fulfilling our potential. My advice is to put fear to one side and look for the positive opportunity in everything you do. It takes courage, but I have always found it to be worthwhile.